Mirpuri Foundation deeply respects our amazing, beautiful, pristine, awesome and unique blue planet, and never had any doubt about the primacy of the ocean in shaping the life on Earth. We’re all totally dependent on this fragile planet suspended in the vast blackness of space. It regulates the weather, produces half of the oxygen we breathe and absorbs a third of our gas emissions. The Ocean sustains our economy, as well as the livelihoods and well-being of billions of people worldwide. For centuries, people have regarded the ocean as an inexhaustible, never ending source of food and a convenient dumping ground, too vast to be affected by anything we do. In the space of a just few decades, it has become increasingly clear that the ocean has limits and that in many important parts of our Ocean the sustainability thresholds have been already breached. Populations of marine species have fallen dramatically and vast areas of essential habitats have been degraded or destroyed, with implications that only now we are beginning to understand. Humanity continues to make unsustainable demands from the oceans, threatening our long-term wellbeing and prosperity. Subsidies that encourage overfishing are worth an estimated 35 billion dollars, even though the global fishing fleet is already 3 times larger than what the ocean can sustainably support. Half the world’s corals have been lost. At current projected levels of warming and acidification, coral reefs could be lost altogether by 2050. Nearly 30% of mangrove cover was lost in the last 25 years. The Artic Ocean is likely to become nearly ice-free in summer within the next 30 years. Around one in four species of sharks, rays and skates is now threatened with extinction. 200 million people live on land that will be below sea level before the end of this century. More than 250.000 tons of plastic pieces contaminate and float in the Ocean. The moment for action has arrived- the rate of change in the ocean tells us there’s no time to waste. Changes are happening in our lifetime. We can and we must correct course now. Tomorrow might be too late. 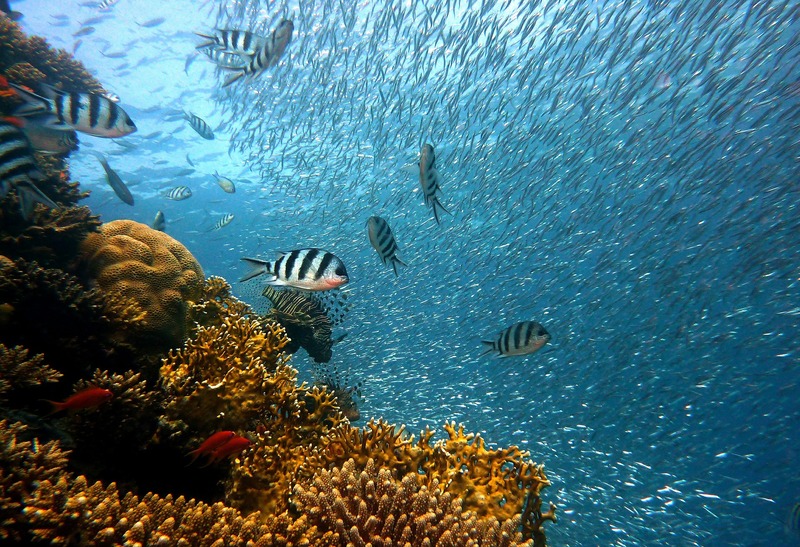 The ocean is a dynamic, interconnected global ecosystem that can eventually bounce back if the pressures are dealt with urgently and effectively. Protecting our ocean is not only a Human being life saving pressing need. It also makes economic sense. Preserve Nature, produce in a sustainable way and consume wisely. Together we can make the difference; together we can save our beautiful, pristine, awesome, unique blue planet and let the next generations enjoy it!